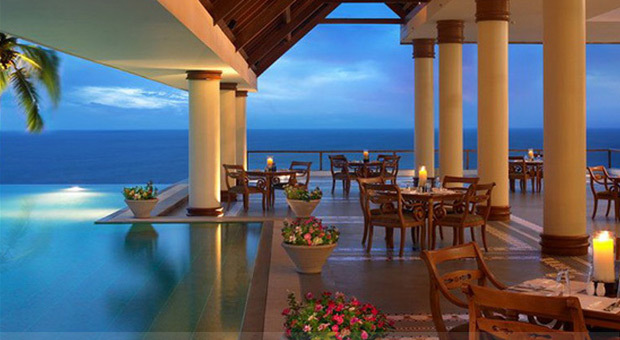 The Leela Kempinski Kovalam Beach, Kerala, is cradled between two sweeping beaches. Perfect if you like listening to the sea from your hotel room, or indulging your inner spa-critic. Going beyond expectations at the Leela Kempinski Kovalam Resort starts at check-in with champagne; it continues with chocolates, fruit, and flowers in your room - and reaches even further heights with a pillow menu. Perched on a rock-face, the Leela Kempinski luxury resort in Kerala offers panoramic views of the famed Kovalam shoreline. The suites are arranged in three wings to ensure that every window offers 180-degree views of the Arabian Sea. A short walk away, take advantage of the famous, crescent-shaped, Light House Beach, or the Leela Kovalam's own private beach - which provides protected bathing with a shower facility and towels. Safeguard your relaxation, and hop in a buggy back up to the hotel. If you need help relaxing, the Leela Kovalam Beach balances state-of-the-art amenities with centuries-old wisdom at Divya, an authentic Auryeda Wellness Spa that utilizes the ancient Indian science of life. The Leela Kempinski Kovalam Beach Resort is a half-hour drive from Trivandrum Airport - now more commonly referred to as Thiruvananthapuram. Thiruvananthapuram and its famous beaches are one of the top tourist destinations in India.